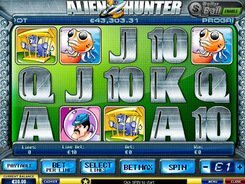 Alien Hunter from Playtech is a fantastic sci-fi slot machine with 5 reels and 25 pay lines featuring colorful aliens, a spaceship, alien hunter and many other themed symbols. Evil space creatures are not your only loot. Be ready to hit your key target of 10,000 coins. Adjust the coin value from a minimum of 1 cent to as high as 2 dollars. The icon of a caged alien is a wild symbol that substitutes for other icons and ensures grand winnings. The spaceship (scatter symbol) activates a free spin round with up to 25 spins if the scatters have appeared on the 2nd, 3rd and 4th reels at a time. The Bonus Egg on reels No1 and No5 triggers a special bonus level. Pick as many eggs as you can to win big prizes, but avoid creepy aliens who finish your fortune hunting. The second bonus level is opened up by three Alien Hunters that appear on an active line. Here you must catch six aliens and put them in a cage. The bonus game has two timespan options: with a 15-second limit and without any time limit. PLAY FOR REAL MONEY!